Coca-Cola is taking its ongoing efforts to expand its consumer-centric beverage portfolio a step further by making information about its drinks – from ingredients to calorie content – more available to more people in more places. “Transparency is part of the character of our company and remains at the heart of everything we do – from the beverages we make and sell, to how we advertise and bring these drinks to market, to the work we do to bring value to the local communities we proudly serve,” said Caren Pasquale Seckler, vice president, social commitment, Coca-Cola North America. This commitment to transparency starts with the company’s most visible communications asset – its packaging. Consumers can access easy-to-find, easy-to-understand nutrition information on the labels of Coke products, empowering them to make informed choices without guesswork. In 2009, Coca-Cola became the first company to voluntarily commit to front-of-package calorie labeling globally on nearly all of its packaging. A year later, Coke partnered with peer U.S. beverage companies through The Calories Count™ Vending Program to add calorie labels to drink machines, boost availability of low- and no-calorie beverages and remind people to consider calories when choosing a beverage. And just last month, The Coca-Cola Company submitted comments to the Food and Drug Administration (FDA) advocating for the new Nutrition Facts Panel (NFP) to be implemented before 2020. The company cited growing consumer interest for more information about their foods and beverages. “To provide consumers with greater transparency about our products, we have already begun placing the new nutrition facts panel on many of our leading brands, including Coca-Cola and Coca-Cola Zero Sugar, and are committed to completing this transition across our entire portfolio over the next 12 to 18 months,” the company said in its written comments. The company said it shared the opinion of policy makers and the public health community that the new label will be an important tool to help inform people about ingredients and nutrients in their food, which helps them better manage their overall diets. Coke’s support for an accelerated NFP implementation is consistent with its position that people should limit their intake of added sugar to no more than 10 percent of their total daily caloric intake. By providing more information up front, the company feels the new labels will help people reduce their overall consumption of added sugar. “The sooner the entire industry implements the revised nutrition facts panel, the faster consumers will become more aware of the nutritional content of their food and beverages – and that is positive for the health of our whole nation,” Coke’s statement adds. Coke’s efforts to give people more information about its beverages now extends beyond packaging and the store shelf. By investing in new technologies and digitizing its data, the company is making it easier for consumers to find the ingredient information they are looking for online – from sugar alternatives like aspartame and stevia, to natural, organically sourced sweeteners, to GMOs. Coca-Cola is an early adopter of SmartLabel, an initiative led by the Grocery Manufacturers Association. SmartLabel™ QR codes give consumers access to more information about the contents of foods, beverages and consumer products. “The purpose behind everything we are doing with SmartLabel is to provide full transparency and promote clear facts on all of our products, to make sure shoppers have access to every possible piece of information to help them make informed decisions,” said Tim Goudie, director of social commitment, Coca-Cola North America. SmartLabel is best suited to consumers on-the-go, in the store and at the point of sale. 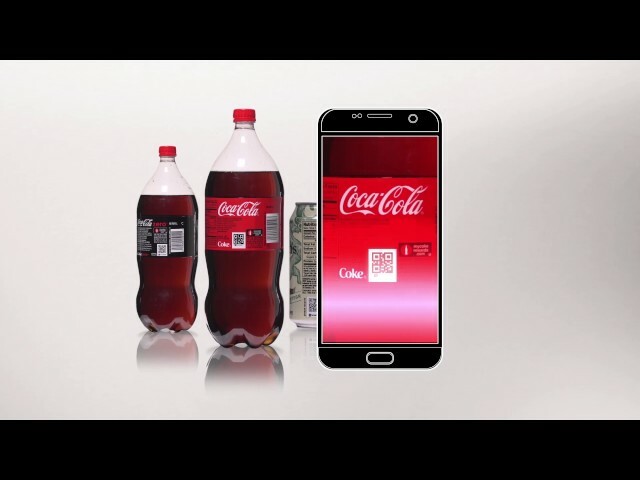 People can quickly scan a QR code on their mobile phones to pull up basic ingredient information as well as additional information such as GMO, allergens, certifications and even learn more about Coca-Cola sustainability initiatives. The company’s aims to add QR codes to all of its beverage packaging by the end of 2018. Coca-Cola is also ensuring people find the right information about its products through search engine optimization directing queries about its beverages to the Coca-Cola Product Facts website, where they can find clear, detailed answers to commonly asked questions about sweeteners and other ingredients. “Through the combined efforts of updated Nutritional Fact Panels, Smart Label with QR codes, an improved Coca-Cola Product Facts website and more, we can provide consumers with even greater transparency and easier access to more product and ingredient information than ever before,” Pasquale said.